You’ve heard the saying ‘start them young’ – well when it comes to The Chongi Martial Arts Academy you couldn’t do better. From the age of 4 and upwards, Thai Boxing and Karate aren’t just fun ways of building your child’s strength, agility and stamina, they’re proven to help with a sense of belonging, well-being and positive mental attitude. All of which are achieved and performed in a safe, motivational and professional space to bring out the best in young people giving them the opportunity to focus on one topic, have the opportunity to think outside themselves, away from the demands of social media and the pressures of networking” before simply by utilizing – simply by the utilizing the very best in the words coach and training techniques. A class for 4-6 yr olds, our goal is to nurture these young people in a safe environment which allows their characters and abilities to develop. Our classes are designed to improve a child’s confidence and fitness levels through fun and lessons from martial arts. The classes are 30 mins long in which the exercises are focussed on the child learning to develop respect for themselves and other students, while learning the basic self defence aspects of martial arts. Many of the parents have acknowledged the changes they have observed in their child, since attending our group. The early years in a child’s life can be paramount in their development, and the values we in still now are put in place and can be utilised by the child in all aspects of their life. The structure of the programme has also been proven to develop the hand-eye coordination of our Mini Chongi’s. We also have a recognition system in place which awards our young students for displaying the basic skills and attributes which are taught and nurtured within our sessions. Contact us for exclusive-use, group and sports team bookings. Our mini Chongi’s will then progress into this class for 7-11yr olds. These sessions are a seamless transition from the younger group, and while we still believe that the fun element is still a pre-requisite for all our classes we introduce more martial arts technique at this stage. Aswell as acquiring new skills the sessions provide improved self-discipline, self-confidence, concentration, mental alertness, co-operation, goal setting advice and anti-bully skills. We ensure that our students appreciate that the physical skills they are learning are strictly for self defence purposes only. We have a grading syllabus that allows them to work through a structured programme which helps them to appreciate the value of dedication and what hard work can achieve. All the kids’ sessions are geared towards the FUNdamentals approach (set out by Sports Coach UK) with aims of developing the child’s ABC’s – agility, balance and coordination using karate activities to achieve this. Matt starts with warm up games/activities. These include fundamental movements, team work and actions essential to karate. During the main session – the kids work towards various objectives, set out by the grading syllabus, following the Yanagi Kai Karate Association guidelines. The last section of session will focus on fitness/conditioning using activities specific to karate. Progress in on-going during the early novice stage and the best gauge is if your child is having fun and wants to come to the session each week. As they become more proficient, there are opportunities to measure progress through grading, assessment as well as running competition that will be focussed on results. Kids can take part in competitions once they achieve the appropriate level of competence and, during these periods of preparation, the main session and objectives will shift towards sparring and the use of effective sparring techniques enabling them to experience an added dimension of the karate discipline. Come on…we’re not that tough, of course our children’s classes aren’t as ‘grrr!’ and ‘ahhggh!’ as our adult classes – but they’re just as fun. And your child will still receive the quality and training from fully qualified instructors to help with their fitness levels, endurance and attention span. Your children will have a great time learning the correct techniques for self-defence whilst giving them a solid foundation in the sport, a proper sense of belonging and learning real team values. Your child’s safety is our number one priority. We’re committed to providing a safe environment to allow children and younger people to enjoy their time at The Chongi Academy here in Crewe for as long as they want to. For your further peace of mind, all staff hold up to date CRB checks, have regular Safeguarding and Child Protection updates and training, and understand their responsibility to act upon and report any concerns. Chongi Academy, Crewe takes your Child’s welfare very seriously and has therefore assigned a Safeguarding and Child Protection Officer who’ll ensure safe practice at all times. A belt? What’s that? Kid’s like critters and creatures – not apparel. So we grade them through their levels by assigning them to an animal they can associate with – not a belt. As they move through their training, young students learn to demonstrate clear development in techniques, fitness, knowledge and discipline. And it’s not without encouragement from the coaches, supporting them at every juncture to aim for their next grade, building confidence and fitness and the urge and drive to be…well…top dog! Looking a mess and getting tangled in the wrong gear is not The Team Chongi Academy way. So we have super-cool Chongi threads to make the most style-conscious youngster feel awesome and look awesome. There are loads of options to choose from to help keep your budget in check and, for the first month, feel free to bring your child along in comfy exercise clothes and trainers until you are ready to invest in their Chongi kit. 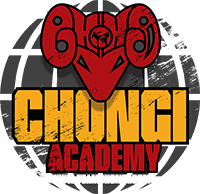 At The Chongi Academy, we don’t just teach your child how to have fun learning the art of Thai Boxing, no, we teach them respect, discipline, how to deal with and encourage healthy competition, ambition and self confidence – whether they win or lose. Respect for their peers and coaches nurtures good sportsmanship from an early age as well as good manners and an ability to integrate outside the gym. And because each child is an individual, at Team Chongi Academy, we’re happy to alter aspects of training to help individual children to develop their fitness levels and build their self-esteem.